In this highly controversial post, a Nigerian successful entrepreneur, Steve Olorun-Ni shared his thought on why he thinks school is STUPID. even when the most stupid man among us knows that “good job” is gone ….. forever? Why didn’t school teach you how to be an entrepreneur? I started my first major business when I was a boy of 15. At age 18, I had started more than 4 different businesses of my own (though small businesses). When I was leaving school at age 21, I was advised to work for a Nigerian bank but I rejected the offer. because I hate being employee! (while about 7 of them are my personal businesses). I have started businesses with hundreds of naira and I have started business with millions of naira. PLEASE, don’t get me wrong! It was NOT easy for me. I struggled with raising capital. I was rejected and neglected by family members. I was mocked by some friends. because for more than 7 years, I achieved NOTHING significant. Today, I’m the MD of the BCV, a registered company in Nigeria which operates from Lagos and worth millions of naira. all those years of struggles has become history. Now, I want to help few Nigerians to become like me. In the year 2013, I got extremely ANGRY that most people are still being taught (by school) to love job. Several other Nigerians who read the book sent me testimonies of how their lives changed. And from there, the book went on to become one of the most influential business books in Africa. 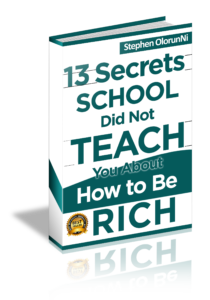 So far, this book (13 Secrets School Did Not Teach You about How to Be Rich) has traveled to more than 25 countries. In the year 2016, I felt that I was already making enough money from my business, so I stopped selling the 13 Secrets business book. Instead of selling this great business book, I started giving it out to Africans, 100% FREE. However, we want to give 5000 copies of the 13 Secrets business book out for now (for free). If you’re fast, you can get a copy of the 13 Secrets Business book for free today. But why are we doing this? and earning meager salary that cannot even take care of their needs (not to talk of having surplus), my heart bleeds. It’s not a sin to work hard (I do work hard than many people). or worse, when there’s nothing to show for your years of hard labour. 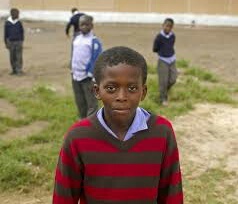 I was born in one of the poorest villages in Nigeria (Oyi-Adio, Osun State). I was born as a SICKLER. If I can become a successful entrepreneur in Nigeria…….. you can. But it’s possible, if you’re willing to learn from an experienced entrepreneur. I created a life-changing 9-day business training in the year 2016. This happens to be another “miracle” in the continent of Africa as most people who attended the training think I’m a business genius. I’m NOT a business genius. 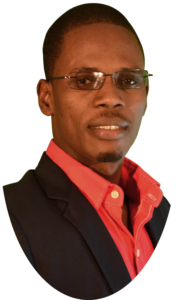 I’m just willing to share my business strategies, tactics, experience and wisdom with you. but who are not willing to share their secrets with anyone. I have been in the business world almost all my adult life. I think business, study business, do business in Nigeria… for several years. Now, I want to share my business strategies and tactics with few serious Nigerians. First 50 Nigerians would have the opportunity to register for our ongoing 9-day business training today . All you need to join is your email address because the training will take place on the internet. I’ll then assume that you’re not seeing the opportunities I’m seeing in This country. If you think there is recession in Nigeria, I’ll simply assume you’re like everyone else. (I have made more money from my business in this time of “recession” than ever before in my life). Do you think complaining about government would bring food to your children’s table? We have decided to give 50 Nigerians the opportunity to register for our 9-day online intensive business training (for today). If you have some questions, you’ll see our organization’s number in any of the above links. Call and one of our staff should answer your call. Or visit our head office at No 9, Hakeem Ogbara Str., Oke-Oriya, Ikorodu, Lagos. Second, Quickly join other Nigerians like you and register for our ongoing 9-day intensive business training. Or come to our office at No 9, hakeem Ogbara str., Oke-Oriya, Ikorodu, Lagos.